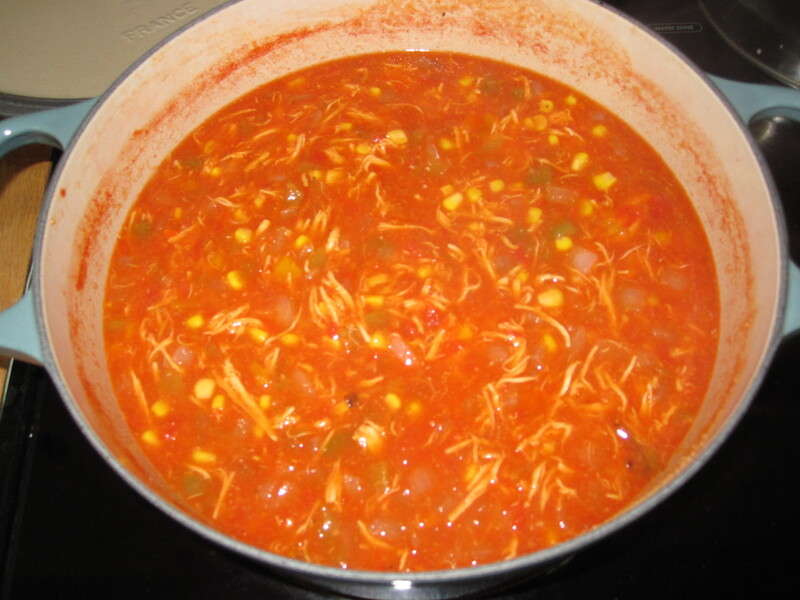 On Monday, I decided to make Chicken Tortilla Soup to have for lunch a few days this week. I think I’ll get 7 servings out of this depending on how full I fill my bowl! I’m planning to freeze about half of this. I didn’t really follow much of a recipe here. I looked at a few online, but really jumped out at me and I’d been craving it for a while. I bought some from the grocery store, and it was really good, but also pricey (Giant Eagle really got me on that, I got like 3 cups but it cost like $7). I cooked the chicken breast in the crock pot this morning. I’ve found that if I basically poach it in there with some chicken broth and water, it shreds really easily and stays pretty moist. I like to do this to have for different lunches throughout the week. Once that was ready to go, I sauteed the veggies in a little olive oil just to get them softened. 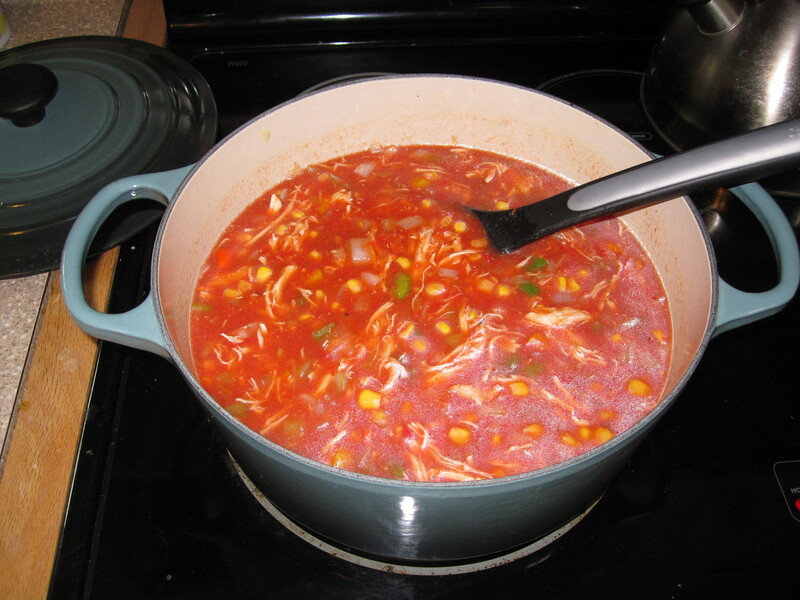 Then I added in about 3 cups of chicken broth, the crushed tomato, the canned chilies, the corn and the chicken. If you know me and my cooking style, unless I’m baking I don’t really measure things like this much unless it’s really going to affect the end result. So I eyeballed the seasoning, probably about 2 tsp of chili powder and 1-2 of cumin and then just a dash or two of garlic powder. I added in the seasoning and stirred it all together and then let it simmer. 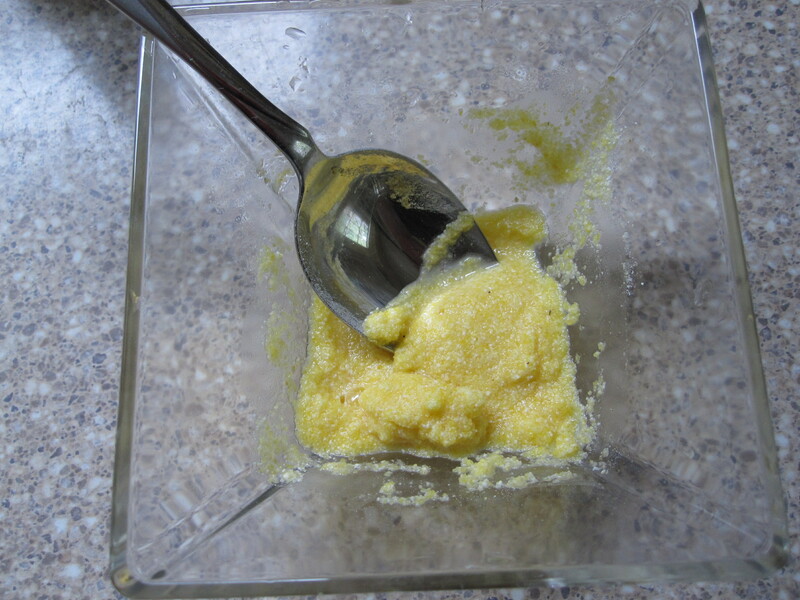 About 30-60 minutes in, I put about a Tbsp of corn meal in some warm water to dissolve and then stirred it in. I let it all sit and simmer on low for about 2 hours. At the very end, I threw in a little bit of cilantro. This is totally up to you! I like it, so I put in a small handful. I know some of my friends hate it, so it can be left out. If I have 6 servings, it will have only 171 calories and 2.5 grams of fat. But honestly, I’m probably going to get at least 7 out of it. 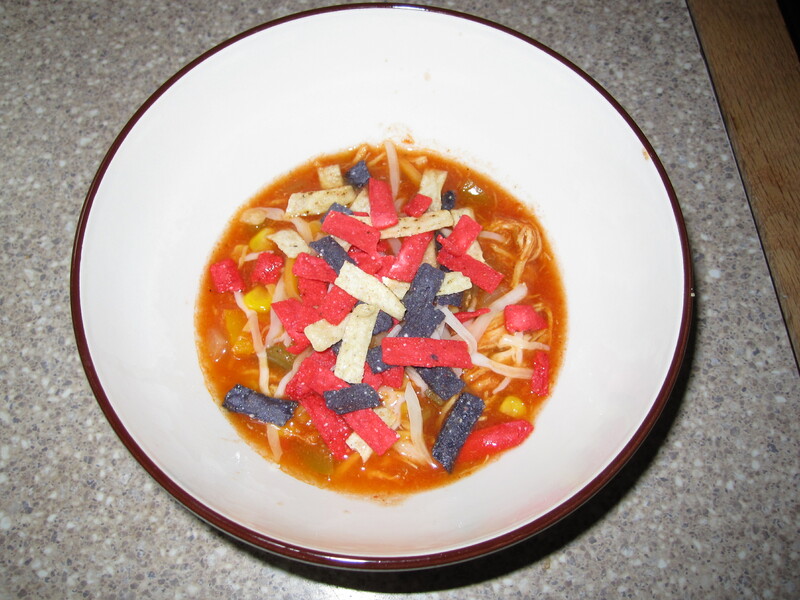 I topped my small bowl with a little cheese and some tortilla strips. This was really good, probably could have used a little more salt as I only put in a few dashes. So this past weekend, my good friend and eating buddy Jen and I went out to breakfast to a new place. I love Pamela’s and De Luca’s for breakfast. And if you are going to get me out of bed early on a Saturday or Sunday to go out to eat, you most likely will find me at one of those two places. Pamela’s pancakes are my absolute favorites and De Luca’s standard eggs, sausage and toast breakfast is great. Plus, I get to go walk around the strip after hitting up either of these places, which is something I love to do. If you don’t know Pittsburgh, the Strip on a Saturday morning is the place to be. There are vendors up and down Penn Ave and tons of people milling about. I just love it. But, this time Jen and I decided to try a new place that we had both heard about, Coca Cafe in the Lawrenceville neighborhood. Our food was fantastic. I seriously debated what to get, there were about 4 things I really wanted to try. One of the starters listed was so tempting, grilled banana bread with honey walnut spread. That sounded so good, and if I hadn’t ordered french toast for my meal, we would have ordered it, but I just couldn’t bring myself to eat some bread before I ate my bread if you know what I mean. I got challah french toast with brie and fig jam. Oh. My. God. It was so good. The challah bread was sliced thick and the brie and fig jam was both stuffed in between two slices of the bread and smothered on top. The fig jam was not overly sweet and really complicated the brie. 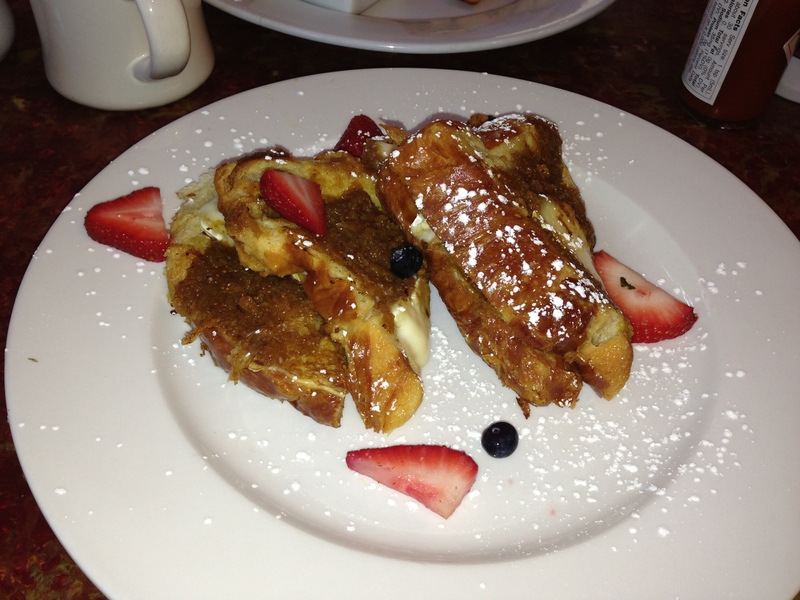 The french toast itself was done perfectly, the outside was just a little crispy and the inside was soft and chewy. Jen got an avocado omelet. Luckily, I have a friend who likes to share so I got to try this as well. 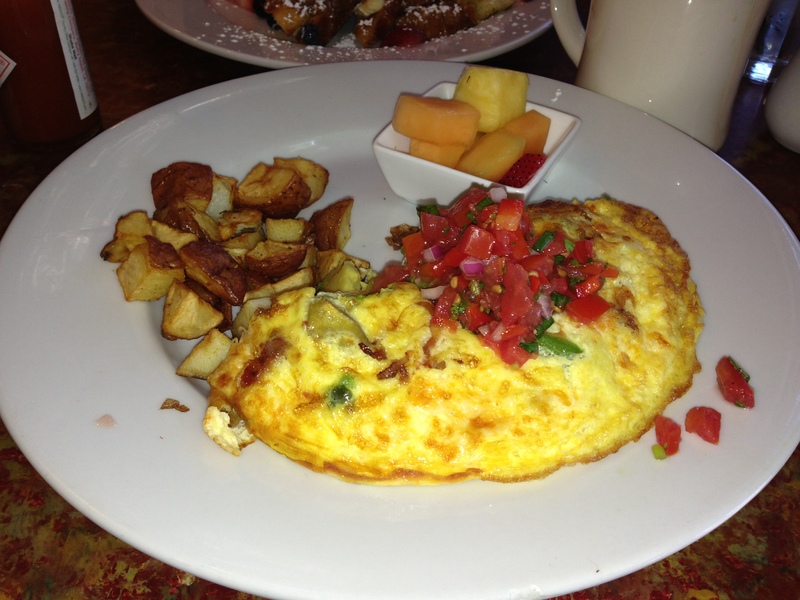 It was fantastic, the eggs were light and fluffy and the omelet was cooked perfectly. The avocado, jalapeno muenster and bacon filling was fantastic and it had a fresh salsa on top that went perfectly with the flavors in the omelet. Overall, I’ll give this breakfast an 8 out of 10. The restaurant was super cute and street parking there on a weekend was pretty easy. When we got there, 5 minutes before they opened, there were easily 15-20 people ahead of us! So if you are going to go, get there early or be prepared to wait. We were seated immediately and the service was pretty good. I will definitely go back here, it would be well worth the wait and I really want to try more of their menu. I believe that they make small changes to the menu regularly so they’ll keep us coming back to try more of their creations. While most importantly, Memorial Day weekend is a time to remember and thank those who have served and made the ultimate sacrifice for our country, it is also the official start to the summer movie season. I love summer movies. To make a generalization, these movies tend to be action packed and don’t usually require a lot of brain power on my part. I can just sit back and enjoy the over-dramatic explosions. I haven’t mentioned yet that I love movies that are typically geared toward men. When the first Star Trek movie (the most recent re-boot) came out I was living in King of Prussia and had yet to make a group of movie going friends. I love my girls out there, but they weren’t always into going to action movies with me. So I went by myself to an early Sunday matinee on opening weekend. I was literally the only woman in the theater. Seriously. You should have seen the looks I was given, the guys in that IMAX theater were so confused. There are a lot of movies coming out this summer, you can get a full list here if you are interested. These are the ones I’m most looking forward to. I know this is already out, but I haven’t seen it yet and I am super excited to go. I tend to avoid these movies on opening week, so I may go and see it this coming week. It brings back Pittsburgh native Zachary Quinto as Spock and Chris Pine as Kirk. The bad guy in this one is Benedict Cumberbatch (I love saying his name, it’s a fantastic British name). You may know him from the BBC series Sherlock. It’s a great show that airs in the US on PBS if you haven’t watched it yet! Yea!! A new Superman movie. I honestly don’t know a ton about this movie, but Zach Snyder is the Director and he brought us 300 and Watchmen, both of which I really liked, so my expectations are high. My best friend is getting married the weekend this comes out. The groom mentioned hitting this up at some point, I’m totally in (kidding Marissa :-)) So I’ll see it the week after! Yes, it’s a kids movie, but I’m rather excited about this one. I loved Monsters Inc and I do love Disney. I can’t wait to see how Mike and Sulley met and came to be the team we met in the first movie! I’ve come to the conclusion that Johnny Depp only knows how to play long haired characters with accents these days. He is American, just in case you forgot. Armie Hammer plays the ranger and I really liked him in J Edgar and in Mirror Mirror (he was a funny bright spot in a movie that was just “eh” overall). This just looks like a fun adventure flick that is perfect for summer movie watching. This is the kind of movie that would be fun to see at a drive in if there were still more than 1 or 2 in the southwest PA area. Hugh Jackman as Wolverine again, I’m in. I just love watching these movies. One of the funniest stories about my workplace was the day I was walking behind a group of engineers, these were guys about my age (mid to late 20’s at the time). They were having a dead serious conversation about which X-Men Character they would be if they were X-Men. I looked at my friend and pointed out that this was the reason I didn’t date people we worked with. But honestly, my answer was Storm. I’d totally be Storm. I honestly haven’t seen a ton about this first, but, being a Sci-fi movie, it’s right up my alley. Set in the year 2154, where the very wealthy live on a man-made space station while the rest of the population resides on a ruined Earth, a man (Matt Damon) takes on a mission that could bring equality to the polarized worlds. That’s the stock description, it could be a good action movie, or really bad, we will have to wait to see! This movie is based on a book series that I really liked. A lot. Yes, it’s a young adult book series, don’t judge me. I’m very worried about being disappointed in how this turns out though. As I recently learned from the movie version of another YA book that I loved, Beautiful Creatures, these books don’t always make the transition to the silver screen like Hunger Games or Twilight did. I have hopes that this will be okay, but with a late summer premier, Sony Pictures is not exactly saying that they have faith in this one, so don’t hold your breath that the other 2 books in the series will be made into movies. 5 Friends trying to complete an epic pub crawl encounter more issues than being too drunk to walk and may end up being humankind’s saviors. This stars Simon Pegg and Nick Frost from Shaun of the Dead and Hot Fuzz. I love these two together, their chemistry is great. And I love British Comedy. So this seems like a good way to end the summer. After all of these movies we’ll enter into Oscar territory for the most part. The movies released for the rest of the year will generally fall into one of three categories. Oscar contender, holiday crowd movie or horror. I usually skip the horror movies, I don’t like being scared all that much. I will see a lot of the other two types though. But a lot of those tend to be very serious, so I’ll take my easy summer movies while I can get them. So, which movies are you most looking forward to this summer? So I just got home from spin class. I love those classes. Seriously, like 725 calories in 60 minutes of spin and about 15 minutes of stretching. I’m trying to increase my flexibility, my goal is to be able to do a split (or at least come close) by the end of summer. So, I spend about 15 minutes doing some serious stretching a day lately. Some trainer once told me that flexibility helps increase your strength potential. Anyway, on to my post for the day! I love movies, if I could go back in time and talk to my 18 year old self, I’d say move to LA and go to film school, just give it a shot because after you’ve started working and making some money you won’t want to take the risk. So if anyone invents a time machine, please let me know. I’ve written one movie script so awful that I actually deleted it after working on it for a few months. I mean, I was so embarrassed by how bad it was that I couldn’t handle ever reading it again. So I settle for watching movies, the good, the bad and the mediocre. I have tried to see the traditionally popular movies, the AFI top 100 especially. I’ve worked through most of it, I’ll have to go see what movies I have yet to watch. One that is typically at the top of all movie lists is absent from mine, Citizen Kane. I’ve seen it, it’s good, I now know what Rosebud is. If you haven’t seen it, you should, just for your own education. It’s epic and it was the first movie that was not told strictly chronologically. Meaning that you knew the end as the movie started and it was mostly told in flashbacks. It was interesting, but it was also a bit on the drawn out side for me. Casablanca – Deep down I’m a romantic and have an old soul (or I’m pretentious as this is a lot of people’s top movie, but that’s not true in this case). 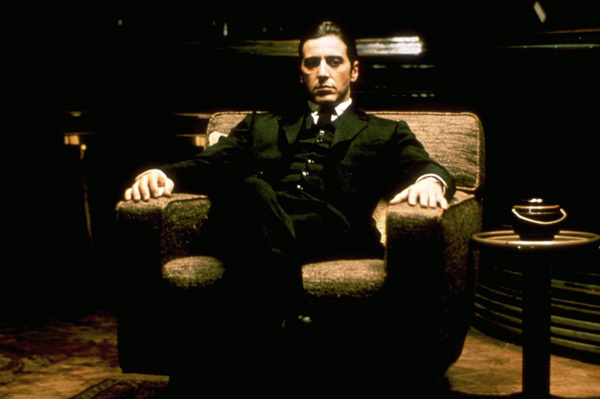 Godfather – What can I say, my Italian roots are showing with this one (or I just like to watch movies with TONS of great actors and lots of action). Caddyshack – I like to throw this one on so people don’t think that I take myself too seriously despite the serious movies on this list (and it’s fun to watch some great comedians all together). North by Northwest – Cary Grant and a thriller. Enough said. V for Vendetta – This is my rebellious side showing. I like to think that in a futuristic dictatorship that I’d be part of the movement to overthrow a crazy regime. I just love stick to the man movies for some reason. And I may as well throw in 6th and 7th bonus movies that I really liked… Inception, it almost knocked V for Vendetta off the list. Leo’s performance is fantastic and it is one of the most original movies I’ve seen in years! The other is Meet me in St. Louis. I love musicals and old movies, this combines both. This is awesome because it has Judy Garland before the drugs really got to her and her rendition of Have Yourself a Merry Little Christmas makes me cry every time. I’ll also state for the record that anything above 3 sometimes move off and on the top 5 list depending on my mood. But for the last decade 1 and 2 have remained the same, it would take something pretty special to bump them from the list. I’ll review each in turn, it will give me an excuse to watch each of them. I also have that list of movies that I watch over and over and over again because they are easy and fun to watch, but because I create my list from a cinematic standpoint, they don’t make the official list. Dazed and Confused, The Holiday, Love Actually, Super Troopers and Beerfest just to name a few. So I’ve been planning to make this recipe for about 2 weeks now and finally bought the stuff for it on my weekly trip to the store this past weekend. It’s really not complicated, it just takes a while. This is a Giada DeLaurentis recipe that I only made one time before, several years ago. For ages, I thought I hated pork, because growing up all of the pork I ate at the texture of rubber because unbeknownst to me, my mom was over-cooking it (sorry mom!). 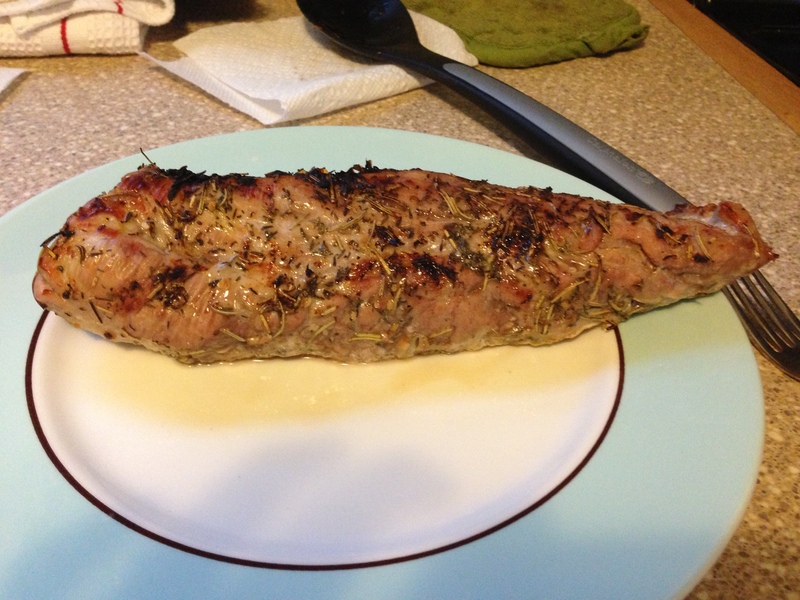 It wasn’t until I had some pork tenderloin out that I realized I loved pork. It is the other white meat after all. 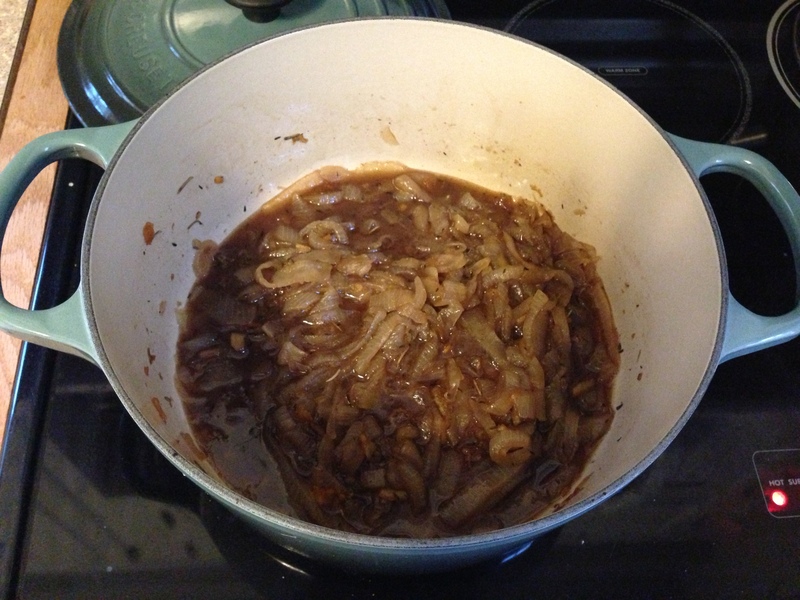 So here is a yummy recipe for a day that you have a few hours to let the onions caramelize. 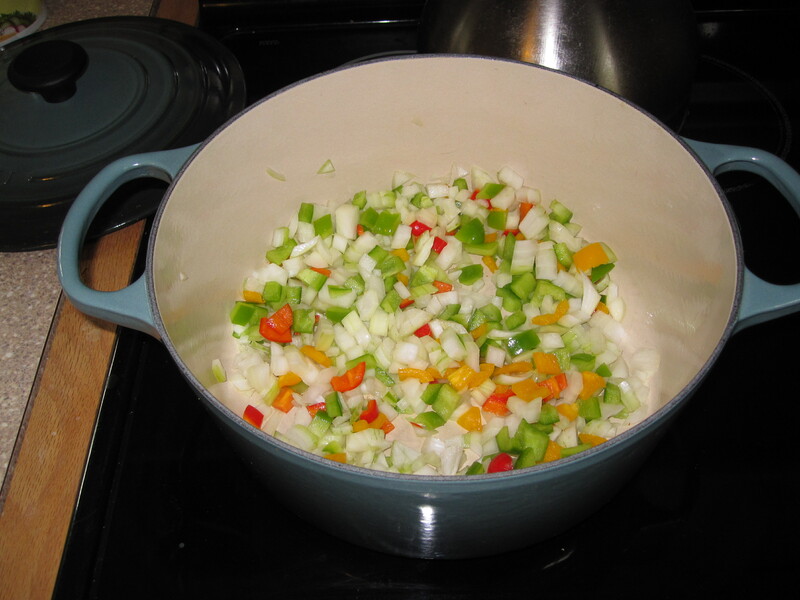 For the onion marmellata, place a large, heavy pot over medium-high heat. Add the olive oil and the onions. Stir to combine and cook until starting to sizzle, about 2 minutes. Add the remaining ingredients. Reduce the heat to low. Cover the pot and cook over low heat for 2 hours, stirring every 30 minutes to scrape up any brown bits. 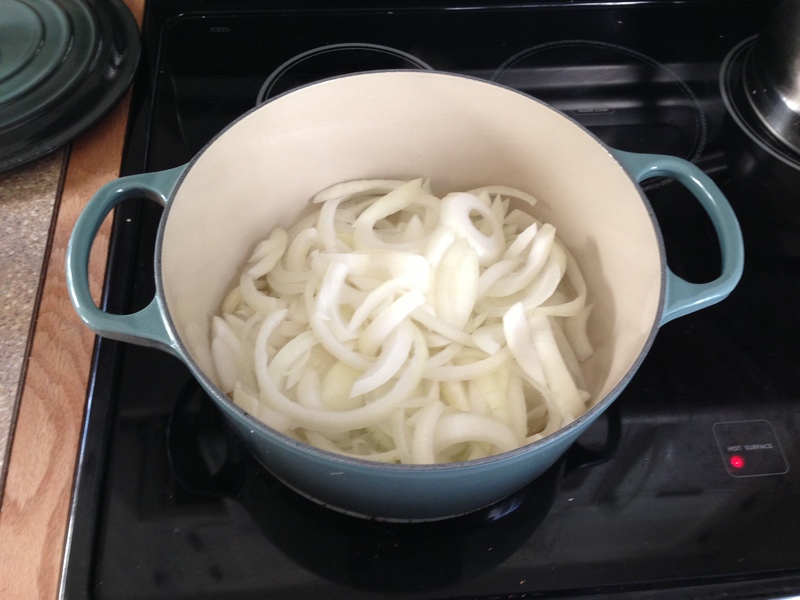 The onions should be a soft, jam-like consistency and a deep mahogany color. This is what it looks like at the end! 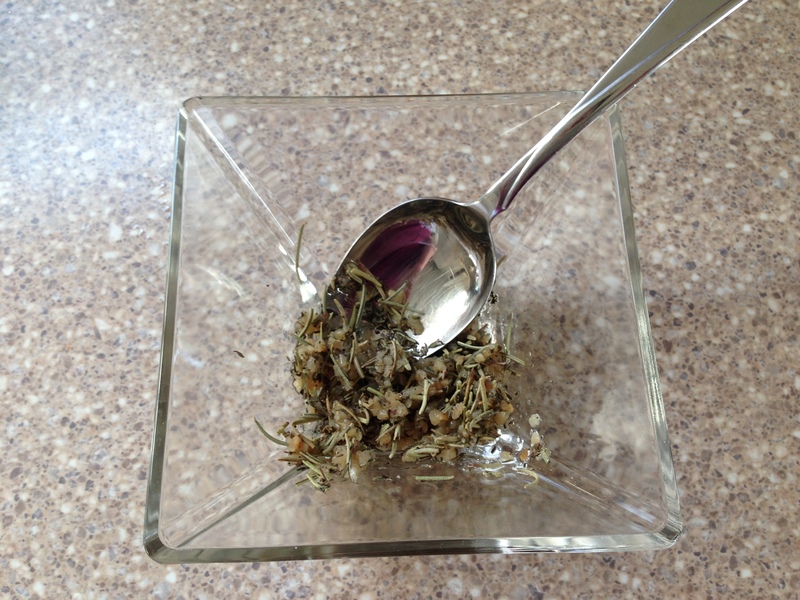 Meanwhile, for the pork chops, combine the rosemary, thyme, garlic, salt, and pepper in a small bowl. Using your fingers, work all the ingredients together until well combined. 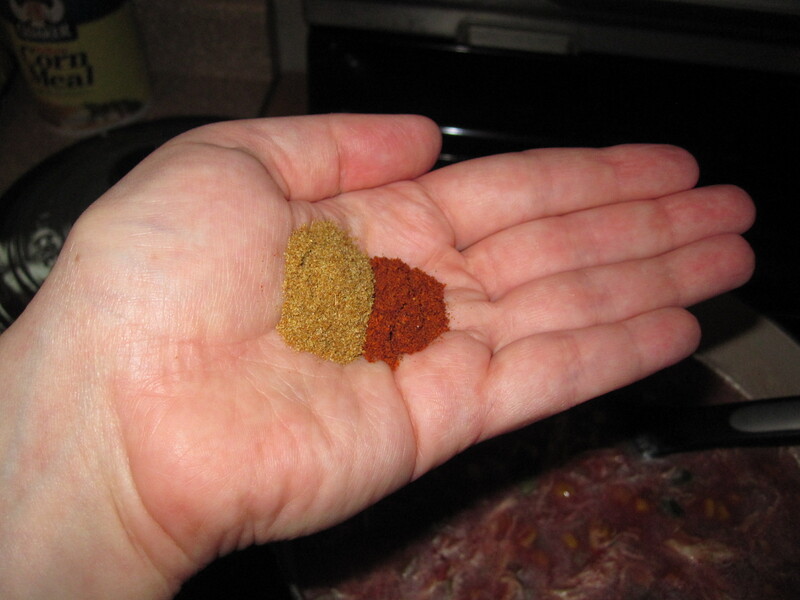 Rub the herb mixture over the pork chops (or loin). Cover with plastic wrap and reserve in the refrigerator. I then went and did my workout. Today was shoulders. I jacked up my right shoulder up back in December. I tried the chiropractor and it got a little better, but not enough. Finally, about 4 weeks ago, I went to see a physical therapist, and it’s finally getting back to normal. I kept thinking, is this what getting old means, being in constant pain and not being able to do a push-up. That’s crap. So I was ecstatic that it started to improve and I could get back to my normal weight lifting routine! 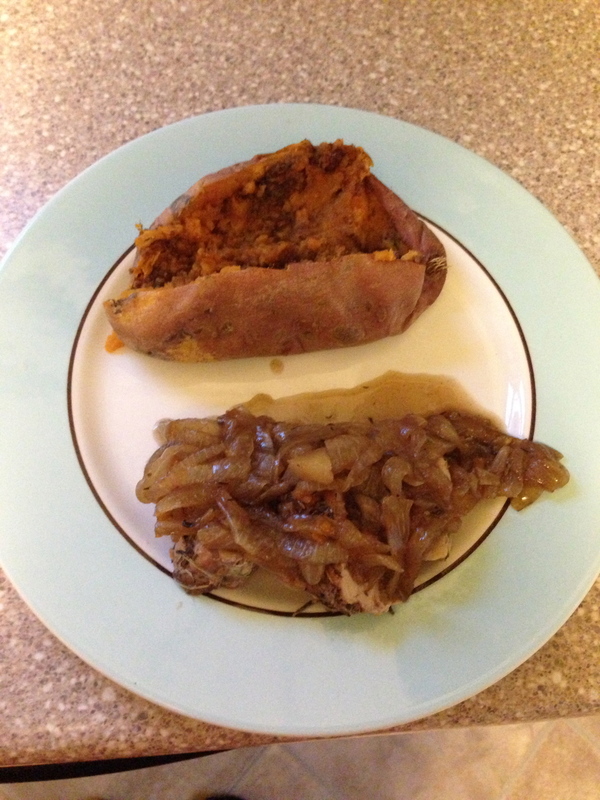 About 20 minutes before the onions are finished, remove the pork chops from the refrigerator. Place a grill pan over medium-high heat or preheat a gas or charcoal grill. Grill the pork chops to medium, about 7 minutes a side depending on thickness. 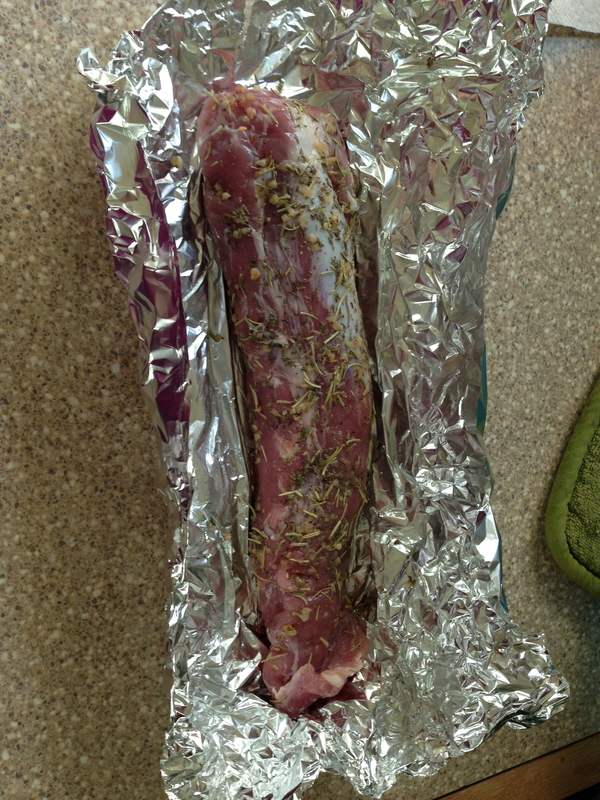 For a one pound pork loin, I cooked it in the oven at 350 for 40 minutes. The important thing is to get it to an internal temperature of 145. To serve, spoon the onion marmellata over the pork chops. Sprinkle with the chopped parsley. Serve immediately. Seriously, this was really good, better than I remembered. My house smelled awesome while this was cooking! I let the pork rest for a bit after I took it out. I ate a salad and heated up a yam in the microwave that I forgot to throw in the oven (oops). While this does have a good big of sugar in it, it only has about 320 calories with 11 grams of fat. Add in the salad with balsamic dressing and yam and dinner is about 540 calories. Not too bad and it’s pretty balanced. Protein (pork), veg (salad), healthy carb (potato). Normally I cook enough for 6 servings of something and freeze half. For this, I didn’t think the onion would freeze well, so I went with just 3 onions and 1 pound of meat, enough for 4 dinners this week. I’ll be sick of it by Thursday. What I normally do is put 3 servings of something in the freezer and pull 3 servings of something else out (or go with sandwiches the other nights) to keep dinner interesting. Also, with healthy home cooked meals in the freezer, I never have an excuse to eat poorly. That doesn’t mean that I don’t go out to eat and splurge or occasionally order pizza, it just means I have no excuse when I do! So that’s dinner for this week. My friend Jen and I are going to try to get to a barre class this week, so I will let you know what that is like if we go! So a few friends, and by that I mean 2 of them, have been asking me if I’d ever start a blog of my own. So here it is. I struggled with what to write about. Being single and in my 30’s? Boring, especially given my dating life. That and I don’t really want to chase away any would-be suitors by blogging about them. So I decided to just go with what I know. So here it goes. Nothing terribly interesting on the food front this week, so I’ll start this blog off with a movie review. This past weekend I went to see The Great Gatsby. I have a serious love affair with Leo. Those my age grew up with him. I remember when he was on Growing Pains, it all started with that appearance. And Leo in a tux or a 20’s style suit, how could I possibly say no. Also, Gatsby is one of my favorite books. If you haven’t read it, pick it up now. It’s a quick and easy read. The movie itself is a different take from the Redford version of 1974. A version I do like a great deal. The music was awesome, but with Jay-Z (excuse me, Shawn Carter) as a Producer and Baz Luhrmann as Director, I expected nothing less. Baz brought us the Romeo and Juliet of the 90’s, which to this day is one of my favorite soundtracks and one of the only romantic movies I was ever able to convince my high school boyfriend to see with me. Overall, I liked the movie. Not the best movie ever, but it was well done and entertaining. I know it didn’t get the best reviews, and there are reasons for that, but it did entertain me. It was a bit slow and felt somewhat drawn out. The book is only 180 pages long, so getting a 2+ hour movie out of it is a stretch. They also took some liberties with the story, but none were terribly out there. Leo was great as usual (I’m a little biased when it comes to Leo though, I’ve only seen like 2 movies I didn’t like him in). Tobey did a great job, but his range as an actor is limited in my opinion. He was great in this role because it’s the exact kind of role he excels at… the slightly dorky outsider who is brought into a very interesting world. This is the first movie I can recall seeing Cary Mulligan in, and at first, I thought her voice and tone would drive me out of the theater. But it was perfect for her character, flighty and seemingly very 1920’s. The scenery and costumes were amazing, I just wish men still dressed like that for a casual afternoon! Spoiler Alert if you haven’t read the book!!! The main difference between the book and movie began immediately, they put our narrator Nick(Tobey) in a psychiatric institute following the events of that fateful summer. This isn’t a huge stretch for me to make, I mean, I’d want a shrink after going through all of that nonsense myself. Now I can see how those who have not read the book would not love this movie. It’s not happy, there are only 2 truly likeable people in the whole freaking movie/book. Most of the people are ridiculously selfish who have little to no grasp on reality. In the end, the bad people get to go on with their lives while our hero dies. I can only hope that the market crash of the 20’s destroyed Daisy and Tom’s lives (not their daughters though). Again, I did like the movie and need to download most of the soundtrack. My spin instructor played the Fergie song in class on Thursday and it was very motivating. So, I hope you enjoyed my first blog post, I will be working on my follow-ups and on making this site a little prettier and more navigable.